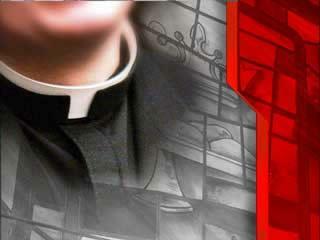 St. Louis (AP) -- Four priests suspended by the Archdiocese of St. Louis amid allegations that they sexually abused children have been laicized, or permanently removed from the priesthood, the archdiocese said Friday. Among the four is Bryan Kuchar, 41, who was released from jail in August after serving three years for molesting a 14-year-old boy. Also laicized were James Funke, James Gummersbach and Michael Seidel. The effort to remove the men began with a request from Archbishop Raymond Burke and required approval from the pope. The moves means they are forbidden to function or represent themselves in any way as priests. The action also means the archdiocese is no longer has responsibility for their support. In a statement, Burke expressed regret for those harmed by the four former priests, and for abuse by any other member of the clergy. The statement said the archbishop "deplores the grave evil of sexual abuse of a minor and reiterates his and the archdiocese's concern for the welfare of all children." A leader of the Survivors Network of those Abused by Priests, or SNAP, welcomed the news but said there are many other priests accused of abuse who are still working. "It leaves still dozens of abusive priests in St. Louis who have not been defrocked," SNAP's David Clohessy said. "Fundamentally, we believe the archdiocese still has to take responsibility for protecting the public from these men." Kuchar was suspended by the archdiocese in 2002 after his arrest. At his trial, the victim testified the sexual abuse occurred in 1995 when Kuchar was associate pastor at Assumption Parish in south St. Louis County. Kuchar was ordained in 1993 and served five St. Louis-area parishes. In addition, he was a member of the faculty at Rosati-Kain High School from 1996 to 1999 and was associate director of the Archdiocesan Office of Vocations from 1999 to 2002. Funke, 58, was ordained in 1974. He was sentenced in 1987 to 10 years in prison after pleading guilty to 10 counts related to the molestation of two teenage boys while teaching at DuBourg High School. In addition to serving seven St. Louis-area parishes, Funke taught at Mercy High School from 1976 to 1979, and at Bishop DuBourg from 1979 to 1986. Grummersbach, 78, was ordained in 1954 and suspended in 1994. He first served a parish in Jefferson City, followed by stints in Union, St. Ann, St. Louis, Ladue, Park Hills, two more parishes in St. Louis, and Richmond Heights. He was also a hospital chaplain from 1972 to 1994, including a brief stint at St. Louis Children's Hospital in 1981 and 1982. In 1999, a jury awarded damages to a man who said Grummersbach sexually abused him as a boy, from 1968 to 1970. An appeals court overturned the case, and the two sides later reached a settlement. Seidel, 51, was ordained in 1987 and suspended in 1998 after the archdiocese determined an allegation made against him was credible. The archdiocese did not elaborate. Seidel served at four St. Louis-area parishes before taking a leave of absence from the active ministry in 1997.